TAVERNELLE VAL D’PESA, ITALY— Years ago, when I first came to Tuscany, I wrote a few columns about how this area reminded me of home. It spoke to me like no other country or region in Europe. Life in Tuscany moves slower, just like life in the American South. The people seem to stop and enjoy the simple things. Tuscans, like Southerners, are friendly, family-oriented people who love food. They, too, live in an agrarian society. 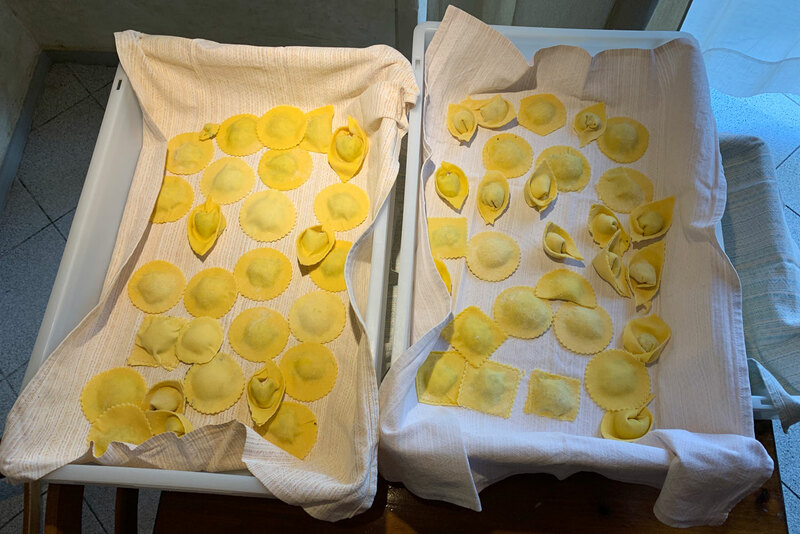 Tuscans love food and family and make time to prioritize both. The trattoria, La Gramola, is owned by a husband-wife team— Massimo and Cecilia— whom I have known for almost 10 years. We eat dinner with them every time we are in town. My best friend, collaborator, and business partner, Wyatt Waters, and I also bring our guests here to learn how to make pasta. The cooking class is approached with caution by some and confidence by others. But by the end of the session, everyone always has fun, and almost all do a great job even if it’s their first time out. The drill on the pasta-making morning is almost always the same. 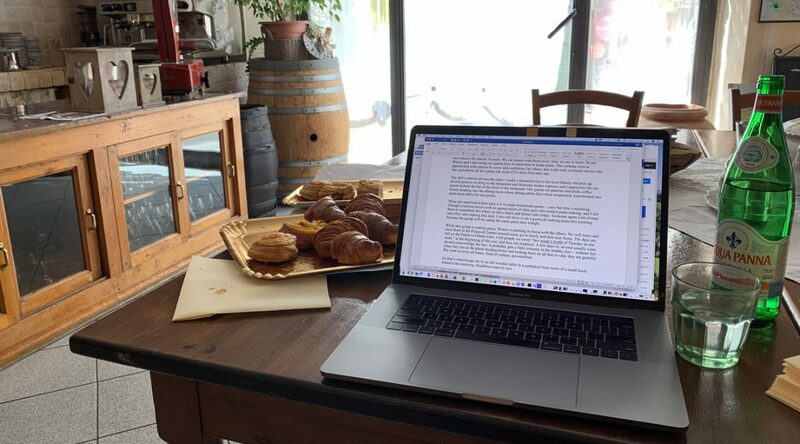 I make a breakfast run to the local bakery and pick up several pastries to bring to the restaurant, and— upon our arrival— Massimo makes espresso and cappuccino for our guests behind the bar in the front room of his restaurant. 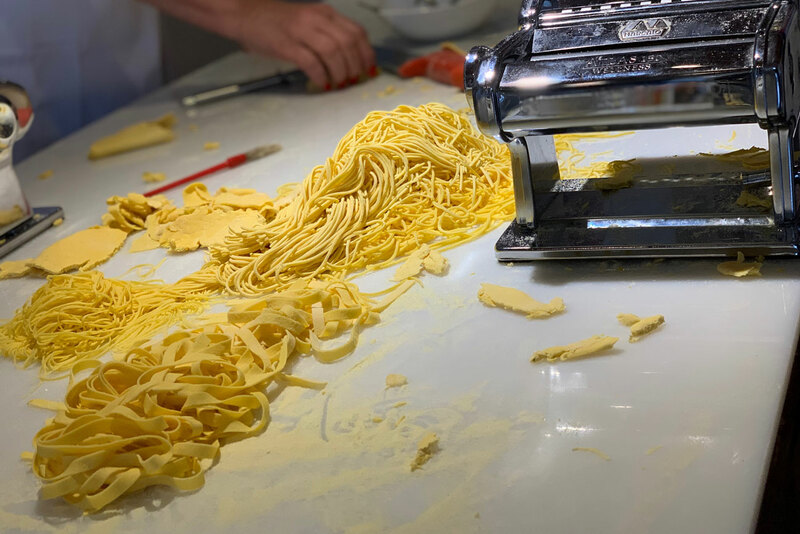 Our guests eat pastries and drink coffee before heading into the dining room where the La Gramola dining tables have been temporarily transformed into pasta prep tables for our guests. 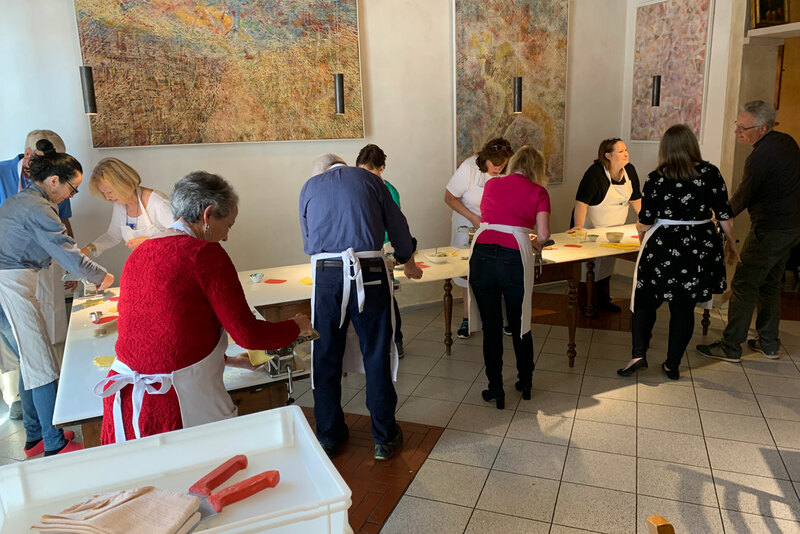 While my group is making pasta, Waters is painting in Siena with the artists and aspiring artists who are travelling with us. Our group will leave and meet them in the Piazza di Campo around noon, go to lunch, and then tour Siena together. The days are full on these Palate to Palette tours. I tell people we cover “two weeks’ worth of Tuscany in one week,” at the beginning of the tour, and they are skeptical. A few days in, some come up to me and acknowledge the fact. It probably gets a little tiresome in the middle of the week, but— without fail— when they are on the plane heading home and looking back on all that we accomplished, they are grateful. We want to cover all bases, food, art, culture, and personalities. So that’s what brings me to an old wooden table in a sunbaked front room of a small local trattoria this morning. Deadlines must be met. Pasta is being made in the other room. My periodic checks on the group verify that everyone is doing a solid job and the pasta is going to be good. Above all I am feeling grateful. I am grateful that I am afforded the opportunity to work in such a beautiful part of the world. It is certainly work— seven days a week for three weeks from 7:00am until 11:00pm— but if one has to work, this is a wonderful place to do it. Actually, it’s only “work” in the sense that there is a fair amount of responsibility attached to it. The logistical aspects can be complicated, but it’s something I love doing and something that I am passionate about, so it’s not really “work” in the pure sense of the word. There is something deep inside of me that loves turning people on to things. I have always loved to discover and then share those discoveries with others. As a kid, it was with music. I spent a huge portion of my youth roaming the vinyl bins in record shops, talking to the clerks about the newest albums and what they liked. I was a radio disc jockey all throughout high school and, one of the greatest benefits of that job was being exposed to new music first. I loved turning my friends onto music and taking advice from them as to what they were listening to. Movies were— and are— the same. If I weren’t a part-time food/travel columnist, I would probably write music or movie reviews. That is how this whole tour thing started. Waters and I worked on a book in Italy back in 2011. We spent 10 weeks, from the southernmost tip of Sicily to the Alps. He painted, I ate and cooked. While we were here, I wrote this weekly column from wherever we were, and he posted his paintings on social media. During the subsequent promotional book-signing tour, people who had read this column, or seen his paintings stated, “I’d love to go over there and eat at the places you ate, meet the people you wrote about, and see the places Wyatt painted.” At first, you think it’s just someone making conversation while you sign their book, but after hearing it again, and again, and again, I called Waters up one day and said, “I think people want us to take them to Italy. Do you want to do this?” He did, and here we are. We made one Facebook post, and the group of 25 filled within an afternoon. We only planned on doing this once, with one group. But there was a waiting list, so we said, “OK, we’ll take one more group for another week.” That was a little over two years and 275 people ago. It all stems from our desire to turn people on to the people, places, food, art, and culture we discovered when we were here working on the book. We are not tour guides. We are enthusiastic fans of this part of the world, and the people who live here. I don’t know if this tour thing is something that we will always do, or even do beyond next year. It’s certainly something we never planned. But there are six groups of 25 people each that are booked for the remainder of the year. It will sure give me joy to continue to turn people on the people, places, and food we have discovered on our journeys, no matter where the deadline may take me.